Design Burd Inc.A Site Grows in Brooklyn | Design Burd Inc. 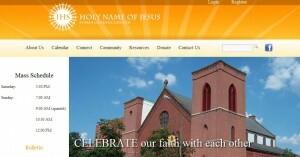 The new site for our friends at the Holy Name of Jesus Roman Catholic Church in Brooklyn, NY has launched and is looking great! Â Design Burd created a custom designed site to highlight upcoming events, services and updates for anyone to reference. Â We inserted a Google Apps Calendar to the site so that current and prospective members of the parish can easily keep up to date on the happenings of their community!